It’s a culture of community building. There are, no doubt, more efficient ways of handling cows and separating them from their calves. Don is gruff. His Dad was gruff and I imagine that his grandfather and great-grandfather were cut from the same tough hide. At six-thirty that morning we were sitting at the large kitchen table, drinking coffee and solving the world’s problems, as if anyone would listen to two old guys. While thus occupied we were looking out of the south facing wall of windows as truck after truck drove past all hauling goose-neck stock trailers with from two to six horses already saddled inside. Don glanced at me and smiled. We often think along parallel lines and he had, no doubt, been musing about how to approach this subject. We drove about five miles out to a corner where three pastures converged. 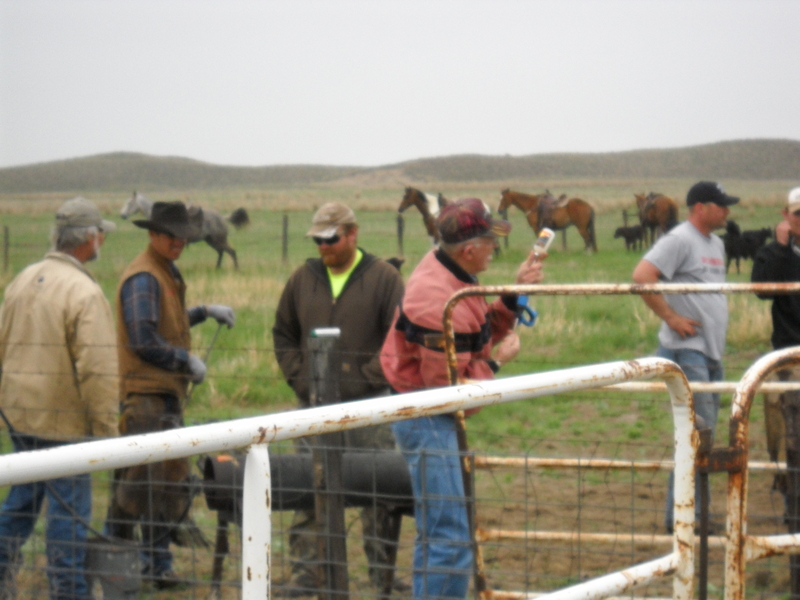 A temporary set of pens and corrals had been set up using panels made from steel pipe. The older gentleman in the pink coat is filling a syringe. The black metal device on legs behind him is a propane fueled stove where the branding irons are made red- hot. The next photo shows the sorting of the cows from the calves. Those are plastic paddles on the end of wood poles and are used to just touch the calves on the face to force them back from the opening. The other folks in the corral are actually helping to keep the cattle bunched up. They are not just standing around. Here some calves are being encouraged to not follow the cow just separated from the group. Here’s the downstream side of the previous photo. The mounted “hands” are ready to rope any calf that “sneaks” through and tries to join the cows. It’s one of the “fun” cowboy parts of the deal. After the calves are separated the real fun begins; one of the hands ropes a calf by the hind legs then drags it to one of two groups of “catchers”, ready and waiting only ten to twenty yards away. The green painted poles in the photo are set in a “V”-shape to separate the two groups of catchers. The two groups of catchers separate themselves into teams of two. 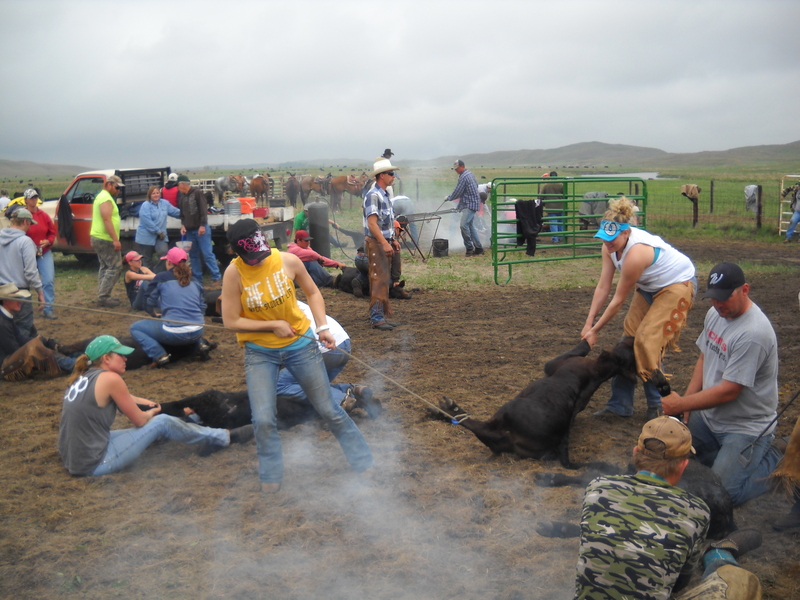 One of the team grabs the rope pulling the calf by its hind legs as the girl in the orange shirt is demonstrating. The other team member grabs the front legs and they lay the calf on its right side and stretch it out, removing the rope. The smoke is from a calf being branded. As you can see this is a unisex activity and everyone pitches in doing equal work. Many of the girls are as skilled at roping as the men and boys. Without any orders being given the participants rotate so everyone has a chance to do all of the jobs. At least three or four generations of family, friends, neighbors and hired-ranch hands, with their children are all working together and learning a set of skills not as easily mastered as you might suppose. The male calves are efficiently and quickly castrated, all calves are vaccinated with two different vaccines and all are branded before they are released. Cattle rustling is still a problem for these ranchers and a well-branded animal is the best prevention. Hot branding has proven to be the fastest and most secure method because it is the most durable. There does not seem to be any lasting effects on the animal from the indignity. Most calves were only stretched out for a few minutes. This little guy was just released and is looking for his mama to tell her about all he has endured. He wasn’t crying or in any discernable pain. 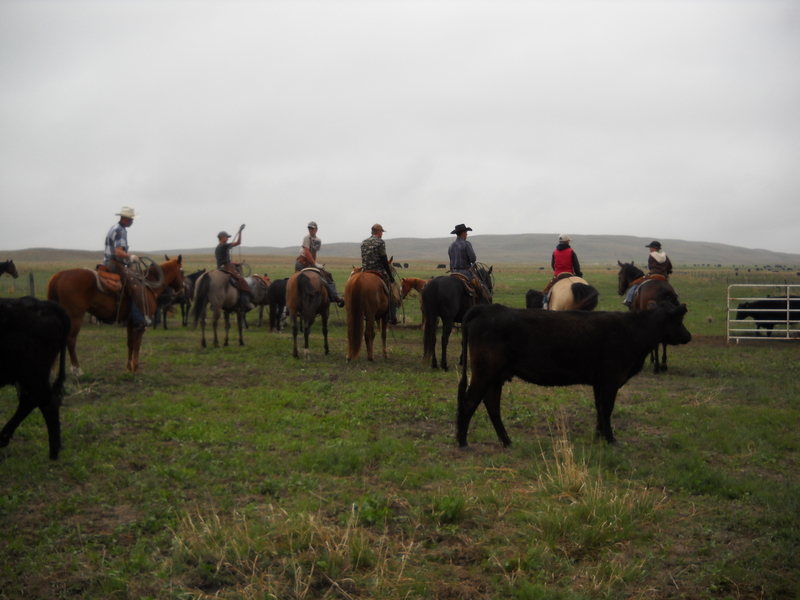 When we were about three-fourths through with the first group of two hundred plus calves a group of riders set out to round up and bring in the second group of cows and calves from an adjacent six hundred plus acre pasture. When the last calf of the first group was finished the second group was already being herded towards the pens. The first calf was branded about eight-thirty that morning. 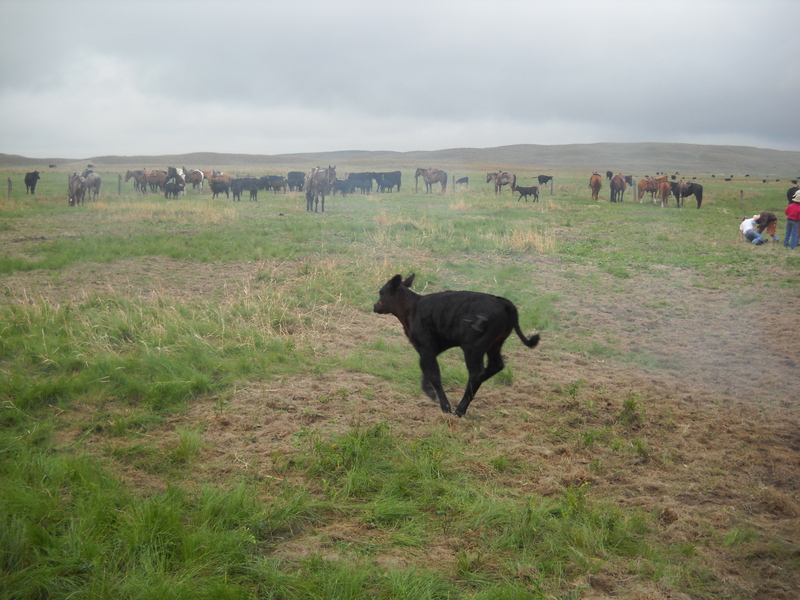 At eleven-thirty that same morning over five hundred and fifty calves were done. At one-o’clock that afternoon all those participating were sitting around card tables on Don and Susie’s lawn waiting for the dinner bell to ring. A few were sipping cold beers but most were drinking soft drinks or iced-tea. All the horses had been cared for and were waiting patiently in their trailers for the ride home. Charlize made the rounds, introducing herself and smelling the wonderful smells of grimy jeans, boots and chaps. At two-thirty almost everyone was gone, they all had work waiting for them at home. 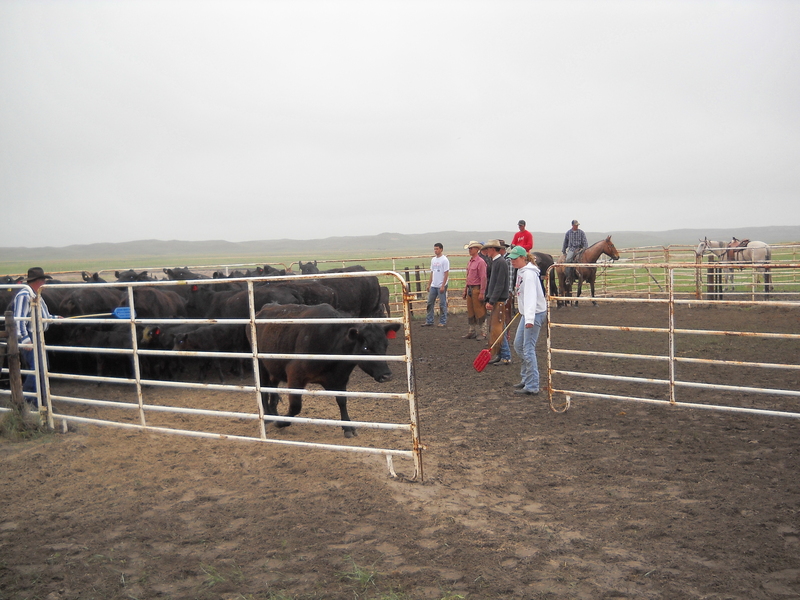 During branding season there are two to four brandings a week scheduled. The ranchers and their help show up and work hard. They are fed well for their hard work but most importantly neighbors and friends help each other to get a job done that is best and most efficiently accomplished by a large group of folks who know what to do and how to do it, the old teaching the young. Damn few things happen that way in our modern society but the Sandhills ranchers have figured it out and keep it going. I’m sure glad they have! My friends Don and Susie were in Phoenix to attend the High School graduation of one of their grandsons, a life cycle event not to be missed. While they were gone Charlize and I made the six hour drive to Denver to revisit old friends and spend some time in the Mile High city. This spring was late in coming to the eastern slope and western plains, late snows and cold. It’s past mid-May and the trees are just starting to leaf out and the grass was just starting to green up and grow on Pass Ranch. In Denver the tulips were spreading their splashes of color and the peony buds were ripening. Bright red-orange poppies were common in the front gardens of the neighborhood of the friend with whom I am staying. The brick house, a craftsman built in the early 1900’s, the original owner, legend says, was a gangster, is only a block away from Cheeseman Park. 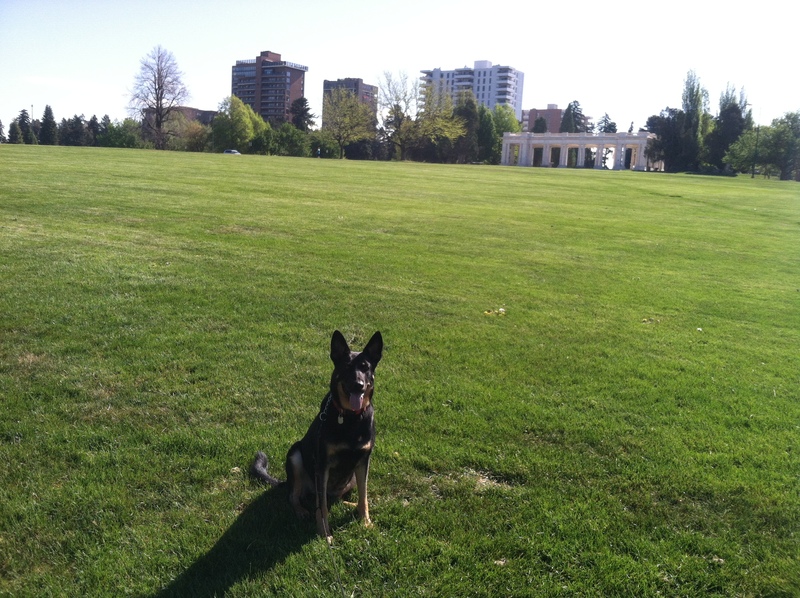 The park has lots of grass, lots of trees around the border, lots of open space and lots of dogs walking their servants. (I presume those folks walking behind with bags of poop previously deposited by the dogs are servants, what else could they be?) Sadly there is no off leash area for the dogs. Charlize was OK with the place but it wasn’t Pass Ranch. I decided to cook. I had been mooching off friends for long enough. I prepared the dinner that Rosalie and I saved for special occasions; my “famous” veal chops Marsala with a breadcrumb topping, braised with shallots and mushrooms then baked. It will be accompanied by spinach pasta with ricotta, Parmesan reggiano cheese and butter mixture and roasted fresh asparagus. My friend Charley, written about previously, brought the wine. Rosalie always baked something special for these events and she was awesome with pies, especially if we had fresh rhubarb in the garden. I don’t bake so I wimped out and purchased a nice looking peach tart at Tony’s. It will be OK but not the same. Everyone who came knew Rosalie. The friend I stayed with is a talker and brilliant at controlling conversations. The conversation was quickly redirected when tears came to my eyes. I still miss her, especially at night. Sleeping alone in a king sized bed after over fifty-two years with a partner is still difficult. I doubt I will ever get used to it, but the days are getting easier. Charlize continues to stay close to me, wherever I go, day and night and she still gets me up each morning with her cold nose. If I don’t get up immediately she puts a paw on the mattress close to my face. That elicits an irritated response from me, no dogs allowed on the furniture and especially not on the bed, but it has the effect she desires, I’m up. While out and about, walking with some of my Denver friends, I glanced in a storefront window as we trouped past. All of us were dressed like the old people we are. All the men were in flannel shirts, jeans and walking shoes, in my case, hiking boots to support my arthritic ankle. The women were dressed in loose fitting pants in a variety of dark colors and coordinated pull over tops. All of us were overweight, to a greater or lesser degree and all of us were limping, but from different causes; knees, hips, ankles and/or backs. One person was pushing a walker, got the picture yet? Last week another of our veterinary school classmates passed away. What a mess life is! The good news is that we can still get around. We still can drink a little wine, enjoy good food and enjoy old friends and laugh. God we do laugh, about shared memories and the sorry state of a world in which we are no longer the movers and shakers, if we ever were. Laughing about our aches and pains seems to lessen them. I have a feeling that when we can no longer laugh the whole thing is over with. The Sandhills are just that, hills of sand and valleys of sand and hollows of sand held in place by a sod formed by the roots and stems of native grasses. 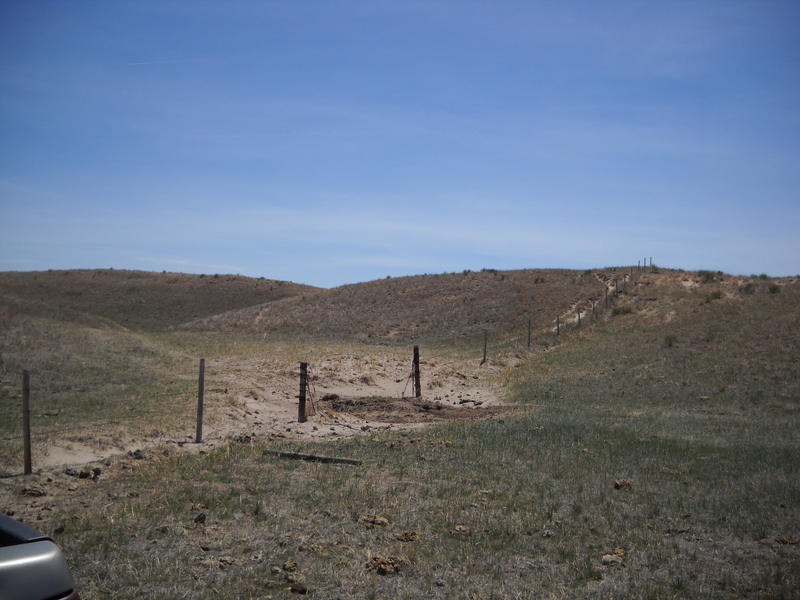 If the grass is destroyed by fire or by too much traffic from cattle or vehicles or a myriad of other possibilities, the result is a “blowout”, a spot where the sand is exposed to the wind and occasional rain. A miniature sand dune desert evolves. In the late 1800 and early 1900’s sections of land, 640 acre plots, in the Sandhills were made available for homesteading. A community of black families settled on portions of what eventually became the Pass Ranch. The new settlers plowed the prairie and were lucky to have abnormally high amounts of rain for a time, but the inevitable happened. With normal amounts of rain, or less, there were no more crops, just sand dunes. Most of these farms were in dire straights when Don’s great-grandfather showed up and offered what everyone considered a fair price under the circumstances. Putting these properties together with the purchase of adjacent rangelands he put together essentially the same ranch that Don now operates. We rode in one of the ranch pickups through various pastures checking on the welfare of the cattle that were divided into groups. Groups of young bulls, old bulls, replacement heifers, first calf heifers with their calves, cows with their calves, steers growing to be sold early this coming fall and heifers separated recently to be soon sold were parceled out in various pastures, sometimes in divided groups and scattered to take advantage of what early pasture grass was available. The ranch is roughly shaped like the state of Kentucky, the fat section, with most of the ranch buildings to the east and narrowing to the west. It is divided into pastures, most taking up roughly six hundred acres some purposely smaller, of hills and small valleys. The flat valley sections are used as hay meadows. We drove slowly. Charlize was loping along side the pickup, her tongue lolling first to one side then the other. Don pointed out the sites of some of the old homesteads. One of them had foundation stones scattered in a small hollow where the house, long gone, had stood. The stones had to have been hauled a long distance by horse and wagon, no place to find stones that big close by. We covered a couple of miles before Charlize started to lag. She was very happy to join us in the cab after refusing to get in when we started out. She should be in shape when we leave if she keeps this up. A few years ago the relatives of one of the homesteaders showed up tracing their family’s history. Don learned parts of the stories he didn’t know about previously, along with names and family lineage. He showed the seekers the sites he knew that were, after many years, reclaimed by the native grasses. There are a lot of stories to be told about those intrepid settlers and what happened to those families. If I live long enough maybe I’ll get to them, if someone else doesn’t do it first. 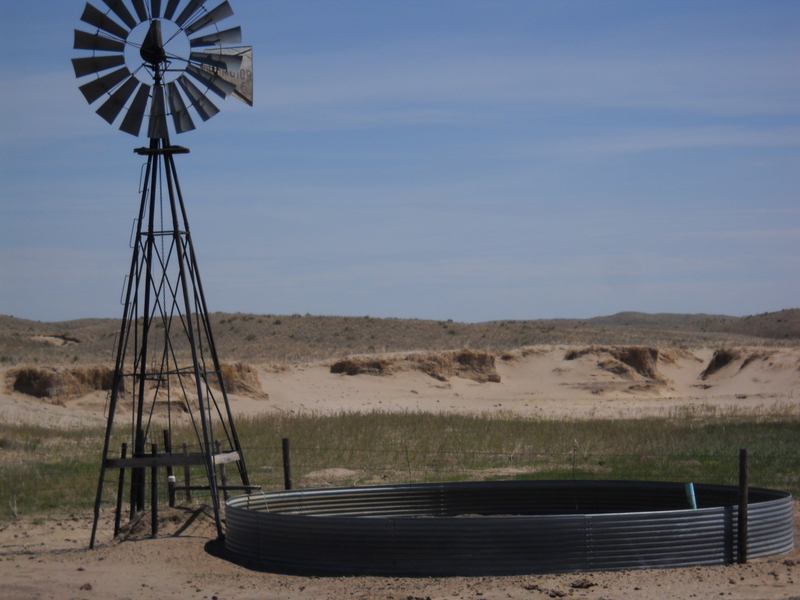 Don and I spent a couple of long days in the far west pastures filling in eroded places at barbed wire gates between pastures and around windmills and water tanks where cattle traffic had done the job of removing all the grasses and other plant life and the sand was eroding. It is another of those maintenance tasks that never seem to be completed. Don drove a large tractor with a blade in front and an excavator/mover implement behind. He scrapped out sod from a nearby site and filled the eroded spots. My job was to follow him in a pickup to the next pasture that needed work, open gates for him to drive the tractor through then close the gate behind us. 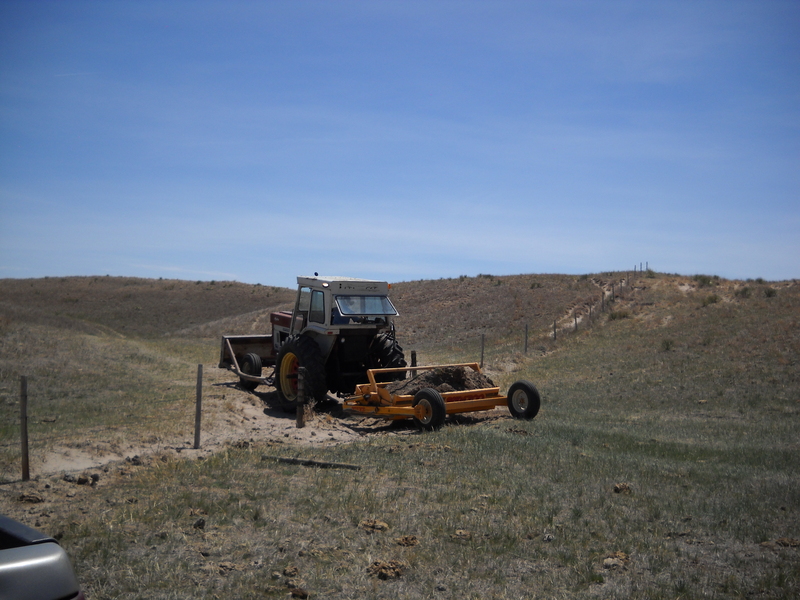 We took the pickup to bring shovels and other tools that might be needed and because he was planning to leave the tractor in those far pastures, probably fifteen or more miles from the ranch houses, until all the necessary work was done. We needed the four-wheel-drive pickup to get back to the house, an hour’s drive away, on dirt tracks and across the pastures and hills. Here’s a tank that needed work. Behind it is a blowout.